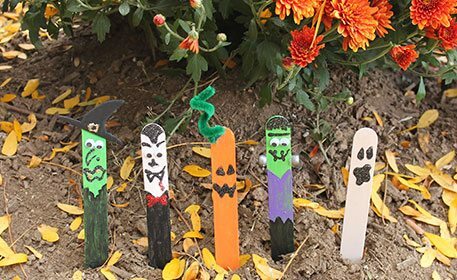 Transform plain craft sticks into some of your favorite classic Halloween characters! Use them as puppets or decorations, either way they're adorable and easy to make! Black Glitter Glue 8 oz. Paint (2) jumbo craft sticks white, (2) jumbo craft sticks green and (1) jumbo craft stick orange. Using black glitter glue, draw (2) triangle eyes and a zig zag mouth. Cut a 3″ piece of green fuzzy stick and curl it around your finger. Glue to the top of the pumpkin. Using black glitter glue, draw (2) large oval eyes and an amoeba shaped mouth. Glue on (2) wiggly eyes to one of the green jumbo craft sticks. Then using black glitter glue, draw a mouth, a unibrow and some hair! Glue a silver pony bead on each side of the jumbo craft stick. Paint a purple v-neck with a zig zag bottom to appear torn for Frankenstein’s shirt, then paint black paints with the same zig zag bottom. Cut out a witch hat shape from black craft foam. Glue the witch hat to the top of the last green jumbo craft stick and glue (2) wiggly eyes below it. Using black glitter glue, draw a crooked mouth, a pointy nose and a small mole on the witch’s face. Add a buckle on the hat and two teeth using gold glitter glue. Paint a black dress on the witch’s body. Draw a widow’s peak hairline to start on the vampire. Then glue on (2) wiggly eyes, draw eyebrows, a nose and a mouth with fangs. Use red glitter glue to add a drop of blood to the vampire’s fang. Paint a black suit on the vampire’s body. Draw a bow tie at the neck with red glitter glue.